Times they are a changing. Go back 15 years or more, and if you wanted up to the minute news, reviews and previews of everything that was going on in videogame land then you would have to wait for your monthly rag of choice to either drop through the front door or land at your local newsagent or WH Smith. Now we can access everything at the click of a button either at home or on the move. However, I’m sure there are plenty of you out there who still read videogame magazine’s; and probably just as many who have been regular readers of the various tomes over the years that have adorned news racks across the country; and fondly remember some of those that are no longer in print. My first foray into gaming magazines was back in March 1988 when I persuaded my mum to pick me up a copy of Your Sinclair while we were in the local newsagent’s. US Gold’s conversion of Rolling Thunder was the featured cover game and amongst the games reviewed were Karnov, OutRun, Gryzor (aka Contra), IK+ and a good number of other well known titles. Your Sinclair (YS) was witty, irreverent, and above all, entertaining. While they may have had their own unique content, neither Sinclair User nor Crash, came close to the continuity of quality and amusement YS provided. Pssst, Slots of Fun, Future Shocks, Trainspotter Award, Tipshop, I looked forward to reading them all; even Programme Pitstop (and I had no interest in BASIC whatsoever!). I pretty much faithfully stuck with YS for over two years, buying my final issue in late 1990 before unceremoniously abandoning the Spectrum era in favour of that of the Atari ST. However, I never really settled on a dedicated ST magazine. I picked up the odd copy of ST Format and ST Action, but neither were as enjoyable as YS in terms of overall content and “feel”. Fortunately, salvation was at hand in the form of Zero. As some of you may remember, Zero was launched by ex-Your Sinclair staffers, (no surprise as both were published by Dennis Publishing, although YS was later sold to Future Publishing), and was very much in the YS mould, but aimed at the newly burgeoning 16-Bit home computer scene. Zero had the irreverent feel that YS so successfully conveyed, yet managed to keep its own identity and distinctness rather than just being a 16-Bit clone of the 8-Bit classic. 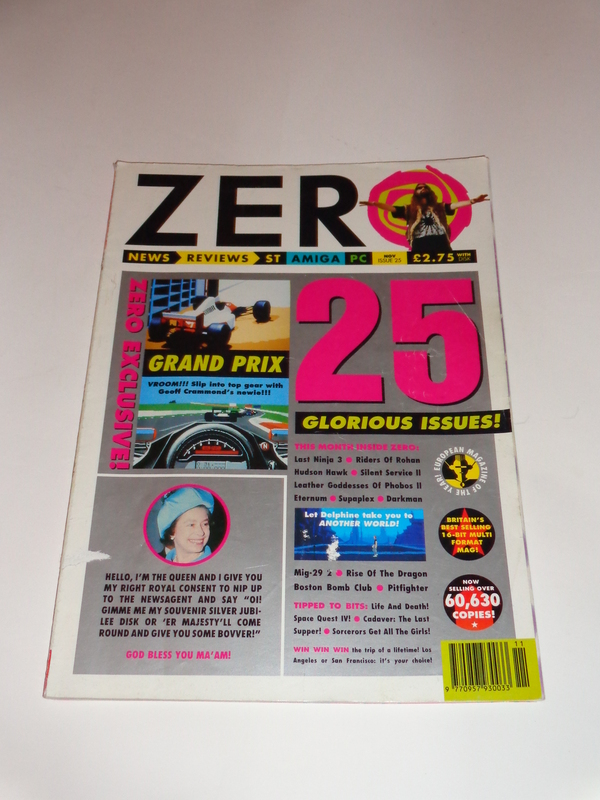 Cleanly presented, with some very memorable content, Zero was once the UK’s best selling 16-Bit magazine, won an Indin Award and very kindly gave me a free copy of Robocop 3 for my Atari ST when I finally decided to fork out for my first ever magazine subscription! With regular pieces from Dave Excellent, Black Shape and the Zero ST; contributions from the likes of David “Whistlin’ Rick” Wilson, Jane Goldman, David “Macca” McCandless, Duncan McDonald, Mike Gerrard et al; plus articles and interviews on all that was relevant to the Amiga, PC and ST gaming scene in the early 1990’s, it seemed Zero could do no wrong. Sadly, Zero was not to have the longevity of its legendary 8-Bit progenitor, despite its awards, droll style and well written copy. Videogame consoles had never been overly popular in the UK during the 1980’s. The scene was dominated by the Spectrum, C64 and Amstrad CPC; and consoles like the Sega Master System and Nintendo Entertainment System were seen as niche, probably due to the cost of the games (£30 – £40) and in-part, poor distribution (only a select few stores stocked these consoles & games back in the ’80’s). However, with the launch of the Sega Megadrive in late 1990, and an aggressive marketing campaign for the system, home computers started to lose ground to this new breed of home entertainment and its “arcade” quality graphics. Plus, at £199 it was cheaper than the 16-Bit home computers of the day and, it has to be argued, did offer an experience closer to the arcade than any home conversion the Amiga or ST could muster. With the shift in games moving from home computers to home consoles came a shift in our reading habits, and with the UK launch of the Super Nintendo, the year 1992 became something of a watershed moment for videogame magazines in the UK. After 55 issues, ACE was discontinued by EMAP, and the first magazine to really embrace the 16-bit home computers of the late 1980’s faded into history during the spring of ’92. My beloved Zero was axed in the Autumn to be replaced by Sega Zone and, the now Nintendo only, Game Zone. The brilliant Mean Machines, (launched by Julian Rignall), which really captured the new 16-bit home console and early ’90’s import scene so well, was also axed; replaced by Mean Machines Sega and Nintendo Magazine System. Ironically, while all this upheaval was going on, Your Sinclair soldiered on to the Autumn of 1993 when Future decided to finally put the legendary Spectrum mag out to pasture after a run of 93 issues. 1993 also saw the launch of Edge. Intrigued by the plastic bag masking the magazine within, Edge was very different to the other videogame magazines about at the time. With an almost industry like slant on its editorial, clean precise presentation and a mature style Edge was a videogame magazine for adults, and I loved it! With the 32-Bit era dawning, Edge really captured the exciting technological changes superbly, as we said “goodbye” to sprites and “hello” to polygons. Perfectly encapsulating the end of the 16-Bit era, the swift arrivals and departures of the CD-32, Jaguar and 3DO, while showcasing the rise to dominance of the Sony PlayStation and Sega’s fumbling of the Saturn. Those first few years of Edge were brilliant, and make a fascinating read today of the rise to prominence of the 32-Bit machines and how videogames became more culturally acceptable and not just the domain of children and nerds. With the launch of the PlayStation in the UK in 1995 I started reading the Official PlayStation Magazine (OPM), but my interest with this tailed off as I started getting more and more into importing. OPM was a good read, and the cover disc was always useful for the demo’s included, but it catered strictly for the UK domestic market, and to be honest, I completely lost interest in the magazine the moment the Japanese PlayStation scene became more important to me. OPM was the last (to date, anyway) dedicated games magazine that I’ve read on a regular basis. Edge continued to be pretty much my staple read until 2012, when, after a 12 year subscription, I reluctantly cancelled my sub and stopped reading the magazine. Edge was, and still is, a very well written magazine, but for me the articles were either becoming too heavily industry focused (in a way I just did not find interesting as I, sadly, do not work in the games industry), or were becoming re-hashes of themes and articles written years previously. Too often I was finding myself just flicking through the pages and then tossing the magazine to one side until the next issue arrived in the post. A great shame really, but for me, editorially speaking, Edge’s heyday was the mid-late nineties where by it covered the games scene in a way that no magazine had really done before, or since. I’m sure a lot of people will disagree with me, but, it’s only an opinion and I do hope Edge goes on for another twenty years or more! Today, print media is slowly becoming a dying trend. Why wait once a month for the latest videogame news and reviews when you can go online and get it now? Still, I look forward to the postman bringing me my monthly dose of videogame retrospectives from Retro Gamer, and with the console market entering its eighth generation, there’ll be no shortage of games and systems to cover as Dreamcast, PlayStation 2, Gamecube and Xbox all now qualify for “retro” status. Well, it probably won’t come as a surprise to many reading this that I am a regular reader of Retro Gamer magazine. I have been inspired to make several purchases over the years from articles published in some of my regular video-gaming reads, and this months copy of Retro Gamer (issue 123) has certainly had an effect. I am a big shoot-’em-up addict, and although I have not been a big fan of Konami’s Gradius series, I have long had an interest to try out its distant cousin – Salamander. With Salamander featuring on the cover of this month’s Retro Gamer, (with a very good article to go with it inside), I finally decided to pick up the Saturn version of Salamander Deluxe Pack; which then promptly arrived on my desk from Japan the other day. More on Salamander Deluxe in a future post. This month’s Retro Gamer also has an excellent feature on classic late 80’s software publisher Cinemaware… I loved Rocket Ranger back in the day, and have long been interested in seeing how it still plays all these years later. So, last Sunday, after it has sat atop a wardrobe at my parents house for nearly 20 years, I decided to recover my once faithful Atari ST. I have long toyed with the idea of bringing the old girl back to life, but procrastination has often got the better of me. However, with the idea of playing Rocket Ranger buzzing around in the back of my mind, and also keen to revisit the classic Carrier Command, I finally dusted off the Atari (literally), and went scouring in the loft of the garage to find what was left of my ST back catalogue. Soon, with a handful of diskettes and my old ST, I was back at my own house, into the Games Room, and hooking the ST up to the TV. To my pleasant surprise it fired straight into life; and using a copy of Activision’s Ghostbusters 2 as a tester, was even happier to see that the machine seemed to be working fine. I will report more on my re-established connection with the world of Atari later on – need to find a joystick, and waiting for a new mouse to arrive courtesy of eBay. One thing that did put a smile on my face during all this was, amongst a small wad of loose diskettes, I found a copy of Jeff Minter’s seminal Lllamatron! No copy of Rocket Ranger though… looks like that’s going to be another eBay job!